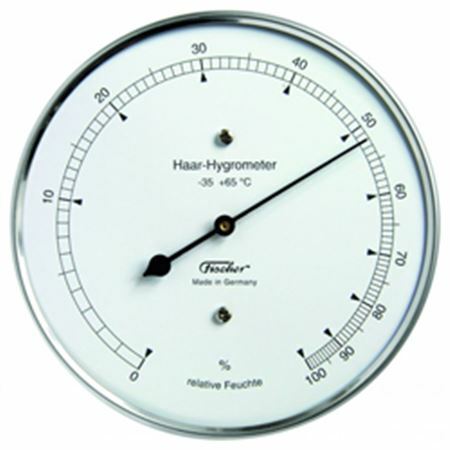 Hair hygrometers are specially used for outdoor measurements or in places where it is very humid. The specially treated human hair of the Hair-hygrometer 11101 is temperature-insensitive (temperature range -35 °C to +65 °C) and reacts quickly to any change of humidity. In low humidity environments, real hair hygrometers will require some maintenance. Please see the Care and Maintenance document in the documents tab. In temperatures up to +80°C (176°F) only high relative humidity will be indicated. In medium to high relative humidity the accuracy of our hygrometers is ±3%. In low humidity it is ±5% after regeneration.